So you’ve decided that you will be booking a magician or mentalist for a corporate event, trade show, gala, or product launch event. Awesome! You know that you want to bring some magic to the event, but how can you collaborate with the entertainer to get the most of your investment? A strolling magician will roam around the room during cocktail hour, or do table magic, and it’s fairly easy to fit them into your schedule. It’s up-close and personal for small groups of people, and doesn’t force everyone to stop what they’re doing to watch a whole show. Sometimes the best and simplest magic happens in the person’s hands. A stage show can be anything from a short 15 min set to a 90 min show. It can be a great way to end a dinner or a conference. I’m a strong believer that it’s the people and their experience on stage that will make the show. That’s why my stage shows are always full of interactive effects that in turn engage the entire audience. More Ideas! 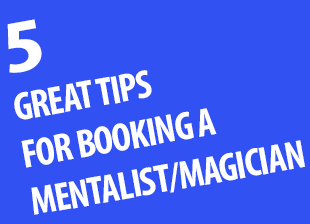 You can use magic and mentalism entertainment in really creative ways. You can mix strolling and stage at your event. I’ve very often performed close up during the cocktail hour, and then a stage show right after dinner to wrap up the event. I’ve entertained people while they wait in massive lines during massive grand openings. I’ve performed very interactive mentalism and magic effects in order to generate traffic at a trade show booth and passed on the prospects to the sales people with a seamless presentation. Talk to your magician and tell them what you’d like to get out of this event, and they will help you make it a success! Performing at kid parties, theater, or corporate events are very different things. So make sure that you hire the right magician/mentalist. Make sure that you book a performer that has at least 5 years of professional experience in the corporate world. I haven’t always been a corporate magician & mentalist. I’ve been performing since I was 12 years old at festivals, kid parties, cirque shows, theater and much more. But in the past several years I’ve been focused on the corporate arena. My show is tailored for each event, and I specifically design it for the theme, message, brand, and atmosphere of the corporate event. Make sure that you verify what they tell you. Ask to see some references to make sure that this performer knows how to leave an impression. Is the room a good match for the entertainment? If there will be more than 50 – 60 people watching the show it’s highly recommended that a raised platform be provided for the stage. (At least 12-18 Inches) Also consider any poles or installations that may be in the way of the performer. If there is an open bar temporarily closing it will help tremendously. If there is a huge empty dance floor in front of the stage it will further alienate the audience from the show. Placing chairs on the dance floor even temporarily during the show will make a big difference. Keep in mind that if people can’t see the show well they begin to chat among themselves and that noise will add up to the point where it can really disrupt the show for everyone. I like to get a good look at the venue/stage area before the show, and if I find that it is awkward in anyway, I tweak my show to make it more inclusive, and engaging. Ensure that either you, the venue, or the performer provides quality sound equipment. (Microphones, speakers, mixer board etc.) Consider getting some lights for the stage as well if the venue is dimly lit. It will bring a lot more attention to the stage, and will make it much easier for the audience to stay engaged. After all you want the performer to bring the magic into your event. So be open about what your expectations are, and pick someone who has some character. The last thing you want is a boring magician at your event. Choose someone with a lot of energy and positivity. I work hard to make every event engaging, awe-inspiring, and memorable for everyone that I encounter. But there is only one way for you to experience it for yourself. Book Yan Markson for your corporate event! Yan Markson is one of Canada's top professional mentalist, magician, and psychological entertainers. Yan's performances are always energetic, interactive, and inspiring. Catch me on Penn & Teller’s TV show “Fool Us” this summer! Book Yan for your event!